I'm gonna use this place to show some of the ancient jewels from Egypt Greece, Rome and the medieval times. Most of the pieces were worn by local kings and nobility of the time so I guess they are a part of the 'royal' jewels of the world although they are now mostly seen as historical rather then royal pieces. Being a farao (or related to one ) sure gives you some nice bling! All of these threads are fantastic (and beyond labor intensive, I'm sure), but this is my favorite one, and such a great idea. Thank you so much, Akasha, for posting all of these wonderful pictures in this and all of the jewelry threads. What?!! It's hard to imagine these being worn on human ears. The gold and amethyst anklet made me want to start wearing anklets again. It's a huge threat (300+ pages!) that they started two years ago. I just take the most interesting pic's and put them together per family here so that you guy's can have a look at the bling with out sifting through all those pages. Well ancient egypt is a a bit of a personal hobby, and the jewels are just stunning so..
Plus, it make our forum a bit bigger and more interesting and might attract more ppl! 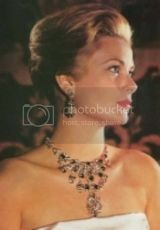 I just thought I'd continue to post some lovely ancient royal jewels! is there a reason the have a long pole above their head? the Egyptian royals were seen as son's and daughters of Ra the sun god, the pole might be a symbolic sun ray linking them to daddy above. This one is gorgeous. I love the little bells on the outermost strand. The crown was like a sun dial either that or a Satellite dish to listen to Ra! This is how the flower looks in real http://3.bp.blogspot.com/_vzpXPZFPxx4/TKR6ykvqoBI/AAAAAAAAAsU/XEMNHsD4sSc/s1600/blue-lotus.jpg it smells really good! in old egypt used it together with other essential oils in perfumes. The Thracians were a group of Indo-European tribes, bizarre people really. Their origins are entirely shrouded in mystery and theory. They inhabited the Balkan peninsula, as well as the adjacent parts of Eastern Europe. It was known that a number of powerful Thracian states were organized, such as the Odrysian kingdom.that consisted largely of present-day Bulgaria. It endured between the 5th century BC and the 3rd century BC and that period is considered the bloom of the Thracian culture. The Thracians were famous for their exquisite jewellery and a large number of elaborately crafted gold and silver treasure sets from the 5th and 4th century BC had been unearthed. The Thracian aristocrats were buried in tombs and so was their jewellery. Now these items were part of the burial of a Thracian princess (around 4th century BC). The wreath weights 200 g of pure gold. It was placed on the head of the princess and over 40 little golden applications were scattered around it. They were probably hanging from a veil once. The princess was also wearing beautiful golden earrings.